Hillary Chybinski: a la cathy zielske. . .
a la cathy zielske. . .
. . .except her lighting is MUCH better than mine. . .how do you suppose she does that? natural glow from within? n e way - i digress. 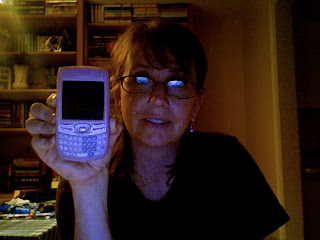 . .
to replace pinky (me beloved pink razr) and my palm pda. the new lightness in my bag and handiness of one unit is very nice. by the time i am 50, i may actually be able to use the functionality of it. but i am enjoying it so far. . .as john would say - it's no iphone. oooooooooo ... aside from the pink part I am SOOOOOO jealous!